The disoriented Hercules leads into a storyline that leads into #100 anniversary issue, which brought back every former Avengers – including the Hulk – in a battle between Earth, Asgard, and Olympus. Following that, the Avengers face numerous familiar foes, including the Grim Reaper, the Sentinels, the Space Phantom, and Magneto. The highlight of this volume is the Avengers-Defenders War, which crossed over between the two titles, both scripted by Steve Englehart. Loki, the step-brother of Thor, and Dormammu, long-time foe of Doctor Strange, manipulate the two super-teams into battle. This has been reprinted multiple times, including in the Essential Defenders books. What is interesting with this volume is Englehart advancing the characters into relationships, bordering on a soap opera. The Scarlet Witch and the Vision start a relationship, much to Quicksilver’s chagrin. Mantis shows up, and wants to claim the Vision as her own. The Swordsman has fallen head over heels in love with Mantis, but can’t get the time of day from her. All of this gets resolved in the next volume. What makes this Essential? 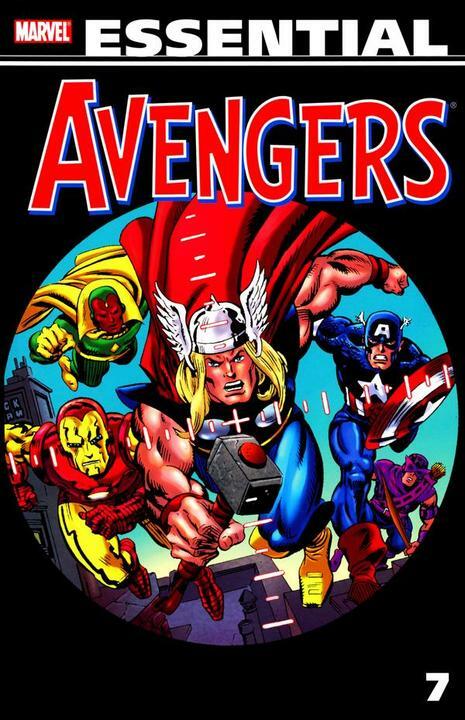 : We see another transition in the Avengers title as Roy Thomas steps down as writer, and Steve Englehart comes in as the new scribe of the book. The X-Men – friend and foes – make numerous appearances during a time when their book was strictly a reprint title. Englehart scripts one of the first multi-part crossovers between the Avengers and the Defenders. With the introduction of Mantis, we start approaching the Celestial Madonna storyline that will dominate Essential Avengers Vol. 6. The downside to this volume is the art, which suffers from a lack of consistency. If you liked Essential Avengers Vol. 4, you should probably have this volume as well to continue the run. 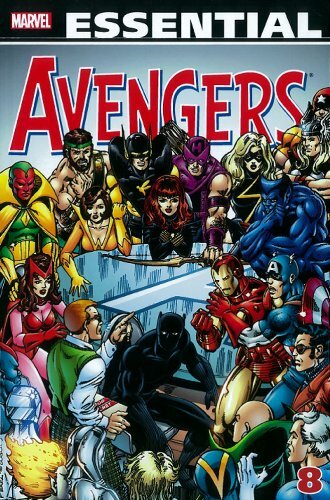 If you like this volume, try: Avengers: Under Siege by Roger Stern and John Buscema. Running in Avengers #270-#277, the Masters of Evil are back with a vengeance, taking down the Avengers one-by-one. 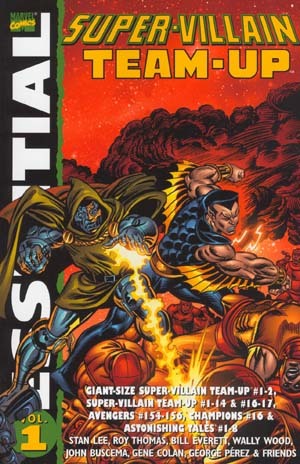 During the onslaught, Hercules is beaten within inches of his life; control of the Avengers Mansion falls over to the bad guys; and even the butler Jarvis is caught up and injured. But falling back to the group’s origins, the Wasp rallies the troops, calling in Thor and Captain America to defeat the Masters of Evil. When fans are asked to name the best Avengers stories, this is easily in the top five for everyone, if not the top choice. This has been collected multiple times and remains in print nearly 30 years after it initially ran in the monthly book. Overview: Hold onto your seats, faithful readers. This is a 29-issue run of Avengers that never lets off the gas, giving us non-stop action that crosses multiple universes. Leading off, we meet the Grandmaster, one of the Elders of the Universe, who has challenged Kang to a game. Kang chooses the Avengers as his pawns, and the Grandmaster chooses from an alternate dimension the Squadron Sinister, whose four members bare a striking resemblance to DC’s Justice League. Later in this volume, the Avengers travel to another alternate dimension dubbed Earth-S, where they meet the Squadron Supreme. This team fights for the side of good, and again contains character analogs for the Justice League. Next up would be the confrontation with the Zodiac, a crime cartel made up of 12 members representing the various astrological signs. In particular, Taurus (Cornelius Van Lunt) would be a constant thorn in the side of the Avengers for many years. During this period, we also learn more about Black Panther, getting his full origin and meeting a new romantic interest for him in Monica Lynne. The concluding story in the volume is the Kree-Skrull War. While it officially begins with issue #92, hints of this looming confrontation had been dropped for months. The two alien races go to war against each other, and Earth finds itself literally in the middle of the battle. The Avengers intercede, leading to a ceasefire and letting both empires know that the Earth is off limits to territorial expansion by either the Kree or the Skrulls. The creators of these issues are some of the all-time greats. This is some of Roy Thomas’ best writing in his long career. The art is alive, jumping off the page thanks to the Buscemas and Neal Adams. We are even treated to a rare comic appearance by legendary writer Harlan Ellison, whose plot concept was adapted into a two-issue story by Roy Thomas for Avengers #88 and Incredible Hulk #140. What makes this Essential? : This is a must-own volume for so many reasons – the creative talent on these books, the introduction of the Squadrons Sinister and Supreme, a new Elder of the Universe, the Zodiac crime organization, the Lady Liberators, and, of course, the Kree-Skrull War! These comics are still influencing ongoing stories 40+ years later. Seriously, if you plan on not having this book in your collection, then I really need to question our friendship. Welcome to Rutland: In Avengers #83, the Avengers and the Lady Liberators travel to Rutland, Vermont, where they take part in the annual Halloween parade. The parade began in 1960, with local resident Tom Fagan being the driving force behind the event. Fagan, a comic book fan, would encourage people to dress in superhero costumes for the parade, and he would wear a Batman costume for the event. Fagan developed friendships with many popular comic writers of the early 1970s, such as Roy Thomas, Steve Englehart, Len Wein, and others. These writers then started incorporating Fagan, Rutland, and the Halloween parade into various stories at both DC and Marvel. In Marvel books, many DC characters could be seen in the parade, and vice versa. In addition to this issue of Avengers, look for Tom Fagan and Rutland to appear in Batman #237, Thor #206-207 (Essential Thor Vol. 5) and #232 (Essential Thor Vol. 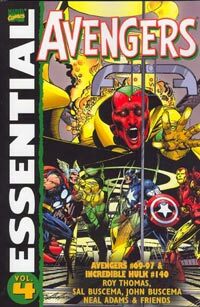 6), Avengers #119 (Essential Avengers Vol. 5), Justice League of America #103 (Showcase Presents Justice League of America Vol. 5) and #145, Defenders #100 (Essential Defenders Vol. 5), Batman #237 (Showcase Presents Batman Vol. 6) and many other comics. 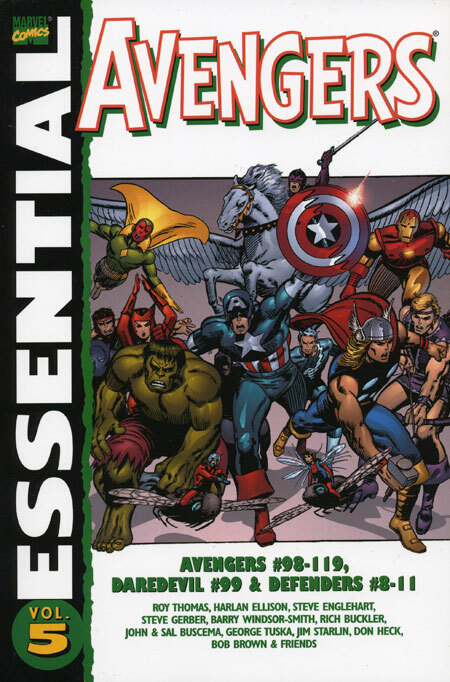 Footnotes: Avengers #88 and Incredible Hulk #140 were also reprinted in Essential Hulk Vol. 3. While 11 of the 12 members of the Zodiac debuted in Avengers #72, Scorpio (Jake Fury) made his first appearance in Nick Fury, Agent of S.H.I.E.L.D. #1 (June 1968). If you like this volume, try: the Secret Invasion mini-series from 2008 from Brian Michael Bendis and Leinil Francis Yu. Following the events of the Kree-Skrull War, the Skrull empire has secretly been capturing various superheroes and replacing them with disguised Skrulls. The ruse comes to light when “Electra” is killed in battle and her body reverts to her true form. Distrust forms among the superhero community, as colleagues question if they have a Skrull in their midst. During a raid of the Skrull world, many longtime characters believed dead were revealed to alive as prisoners of the Skrulls. Battles ensue as the Skrulls make a full-blown of invasion when their plan is revealed. The Skrulls are defeated in a final battle in Central Park, as a long-time Avenger makes the ultimate sacrifice to stop the Skrull threat. This has been collected as both a hardcover and as a trade paperback. Overview: Bring on the Bad Guys! With so many comics told from the perspective of the hero, sometimes you want to view the world from the other side of the confrontation. For most of this book, the focus is on Dr. Doom, ruler of Latvia. The stories from Astonishing Tales deal with Dr. Doom trying to stop a rebellion, which turns out be organized by Red Skull. Doom’s attention is soon turned towards the Black Panther, as a skirmish develops between Latveria and Wakanda – not the first time that’s happened, and certainly not the last time either. When the actual issues of Super-Villain Team-Up starts, it’s between Dr. Doom and Namor, the Sub-Mariner. Depending upon the needs of the story, Namor has been both hero and villain over his many years in comics, and we see that in this volume. It starts out with Namor and Doom in conflict, which is then turned into an uneasy alliance of sorts. While battles rage between Namor and the Atlantean warlord Attuma, which crosses over with the Avengers title, Dr. Doom must continue to stave off rebellion. But the mysterious Shroud shows up — but is he hero or villain? Towards the end of the run, the publishing schedule got quite erratic. The title came to an end, but the final storyline was wrapped up over in the pages of the Champions, with the team loaded with former X-Men facing off against Magneto. The Red Skull makes another appearance in the final two issues published a year apart. What makes this Essential? : This really is not an essential book. There, I said it. Hate me or love me for it. What we have here is a loose conglomeration of stories that are grouped together under the banner Super-Villain Team-Up (SVTU). Given the number of various talents that worked on this throughout the 1970s, this was never intended to be one giant story. Instead, we get Writer 2 picking up on the story threads left by Writer 1 two years ago in a story, and continuing them for three issues until Writer 3 came in and changed the threads completely. Personally, I would have rather seen (and still hope to see someday) an Essential Doctor Doom volume. Collect his various appearances all over the Marvel Universe in one edition. That would be much more interesting to see collected then this SVTU collection. 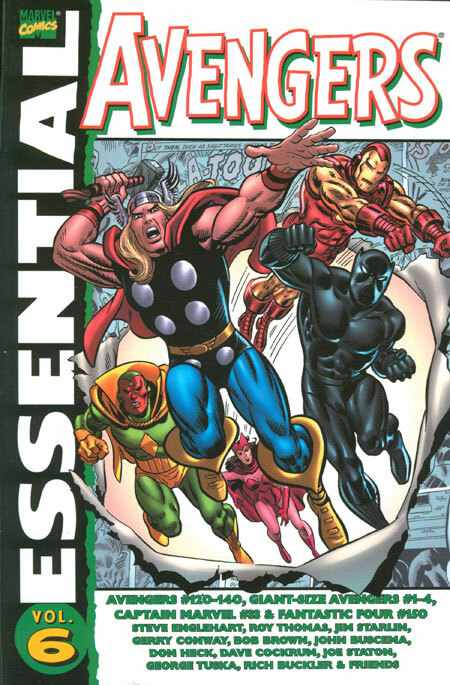 Footnotes: Super-Villain Team-Up #9 and Avengers #154-#156 are also reprinted in Essential Avengers Vol. 7. Super-Villain Team-Up #15 was a reprint issue, with stories from Astonishing Tales #4 and #5 (included in this volume). The cover is included in this Essential. If you like this volume, try: the Secret Society of Super-Villains (SSSV) from DC. This came out during the mid-1970s, around the same time that SVTU was on the stands. DC’s story had a team of villains assembled (Gorilla Grodd, Captain Cold, Mirror Master, Sinestro, Star Sapphire, Lex Luthor, Bizarro, Darkseid, and many more) working together to take on jobs that they couldn’t do as solo criminals. Much like SVTU at Marvel, the SSSV storyline continued in other DC books long after the comic was cancelled. DC has recently collected the entire SSSV storyline into two hardcover collections. Overview: Welcome to the Mighty Avengers! Writer Roy Thomas takes full control of the issues collected in this volume, putting his own vision (pun intended) into the team. The Avengers welcome two new members: Black Panther is brought in from the pages of Fantastic Four; and the Vision is introduced as a villainous pawn who overrides his original programming and stands with our heroes. Hank Pym adopts yet another identity in Yellowjacket, and Clint Barton discards his bow and arrows as Hawkeye to take over as the second Goliath on the Avengers team. 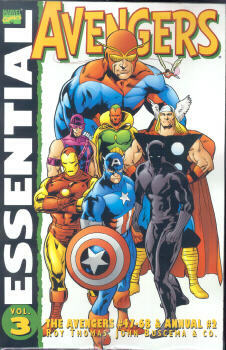 A new Black Knight is introduced, but he will not officially join the Avengers team until the next Essential volume. We also get the introduction of two foes that will plague the Avengers for decades to come. The Grim Reaper shows up to take vengeance on the Avengers for the death of his brother Simon Williams, the original Wonder Man from Avengers #9. Things would get much more complicated when it is discovered that the Vision has the memories of Simon Williams, making him a step-brother of sorts to the Grim Reaper. And Hank Pym inadvertently unleashes an evil unto the world with his creation of Ultron, a self-replicating robot that desires nothing more than world conquest. Ultron places the Vision into the team as a traitor, only to be betrayed by the synthezoid. Ultron would return over and over again, with plans of ruling the planet and punishing his “father”. What makes this Essential? : I see a transition in the Avengers title in this era. The team becomes less focused on being the world’s mightiest heroes, and instead becomes one large family, albeit dysfunctional. Early stories in this volume deal with the Scarlet Witch and Quicksilver trying to break their connections with Magneto. Pym “fathers” Ultron, who in turn “fathers” the Vision. Grim Reaper seeks vengeance for his brother, and finds his brother’s personality and memories alive in an android. Hawkeye comes face-to-face with his long lost brother. And Pym and Janet Van Dyne tie the knot in the first wedding ceremony at Avengers Mansion, creating a whole-new dynamic for the team with married super-heroes. This may sound a lot like a soap opera, but it works for the Avengers. As a reader, I want to keep coming back to see what is going to happen next to these characters. These family issues is what made the Avengers so fascinating throughout the 1960s and 1970s. Footnotes: Avengers #53 was also reprinted in Essential Classic X-Men Vol. 2. Avengers #61 was also reprinted in Essential Doctor Strange Vol. 2. Beginning with issue #62, the word “Mighty” was added on the cover, making the cover title read The Mighty Avengers. If you like this volume, try: the Last Avengers Story by Peter David and Ariel Olivetti. Issued in 1995 during the painted art wave of comics, this prestige format book takes place some number of years in our future. Ultron has destroyed Avengers Mansion and the team inside. Fueled by grief and anger, Hank Pym tries to assemble what remains of the Avengers team to defeat Ultron one last time. Gathering up the Wasp, Hawkeye, She-Hulk, Human Torch, and Cannonball, this Avengers team takes on Ultron, as well as the Grim Reaper, for a final resolution. This story has been collected multiple times, most recently in the Avengers: First to Last collection from 2008.